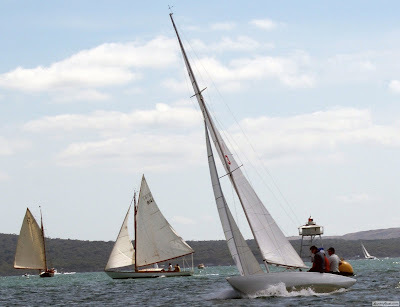 Auckland’s maritime history will come alive on the Waitemata Harbour on Monday, 1 February with a fleet of vintage, classic and modern please, racing and work boats vying for line honours in the 170th Oceanbridge Auckland Anniversary Day Regatta. Tall ships, gaff riggers, sloops, racing keelers, sailing dinghies, radio controlled boats, elegant classic yachts and grunty tugboats, all under the gaze of the flagship, the navy frigate HMNZS Te Mana, will be out on the water competing in a full day of racing and displays. Among the contenders in the classic yacht division will be Jason Prew who owns two classics and is looking after another two as he continues his love affair with these beautiful craft. 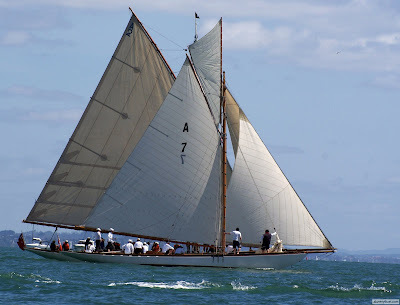 He will be racing restored beauty, Rawene, competing against some of Auckland’s legendary racing yachts for line honours on the Waitemata Harbour including Thelma, Rainbow, Ranger, Gloriana, Tawera and Little Jim. Many of these beautiful vessels will be lit on Sunday evening at their moorings in Viaduct Harbour. A7 and A2. Supplied image. Two Australian classic yachts, Wraith of Odin and Fair Winds, will also race in the 170th regatta and then compete in the four day Southern Trust Classic Yacht Regatta starting on 12 February. A highlight of the day will again be the tugboat race with some 30 tugs and towing launches, many of them vintage vessels, from around Auckland, Northland and Bay of Plenty, joining the line up. It will be a real family affair for the seafaring Thompson clan, headed by Jimmy Thompson, founder of Thompson Towing, who is described by son, Mike “as mental about tugs”. The extended family includes members of the legendary Lidgard Bros boatbuilding family and the Browns, well known as coastal tugboat and tender skippers. Three generations will be racing in the tug and workboat race with the Thompsons entering three of the five tugs they own. A new course has been set with the finish line off the southern end of Devonport Wharf, providing great vantage points for landlubbers to enjoy the action. At 11.30 am following the race, there will be a display and parade of tugs through the ages around Viaduct Harbour. Many of the tugboats will then berth at the Viaduct to allow closer inspection by enthusiasts. “We’re expecting the best fleet yet with hard competition and a feast for the eyes,” says tugboat race organiser, Baden Pascoe. The Royal New Zealand Navy frigate HMNZS Te Mana is the regatta flagship for the day to provide additional pomp and spectacle to the Anniversary Day Regatta which is now known as the Oceanbridge Anniversary Day Regatta to acknowledge the long term sponsorship of North Shore based shipping company and sailing supporter, Oceanbridge. HMNZS Taupo, one of the new inshore navy patrol vessels, will be the official race committee boat for the 2010 event and will be positioned on the race start line off the end of Princess Wharf enabling spectators on shore to get up close to the action. There will be excellent vantage points around the harbour shoreline and North Head, Bastion Point and Orakei. Onshore, there will be a lively programme of entertainment all weekend including the Auckland Buskers Festival, the Auckland Seafood Festival and free entry to Voyager National Maritime Museum. “This really will be a wonderful birthday to celebrate Auckland,” Mr Mahoney said. On the Sunday evening, 31 January, some of the stars of the classic yacht fleet, fresh from a day’s racing, will be berthed and lit up at the Viaduct Harbour at O’Hagan’s Landing (by Simunovich Fisheries). Around 11.30am on the Monday after the tugboat race and a parade and display to show off their power and agility, some of these old-timers will be berthed at the same place and members of the public are welcome to look them over. There will be a lot of activity around the viaduct as the regatta fleet heads to the race grounds in the harbour under the watch of the Royal New Zealand Navy frigate HMNZS Te Mana, the regatta flagship for the day. HMNZS Taupo, one of the new inshore navy patrol vessels, will be the official race committee boat for the 2010 event and will be positioned on the race start line off the end of Princess Wharf enabling spectators on shore to get up close to the action. There will be excellent vantage points around the harbour shoreline and North Head, Bastion Point and Orakei. The family of regatta sponsors headed by Oceanbridge Shipping Limited also includes Auckland City Council, Ports of Auckland Limited, Classic Hits 97.4FM, Southern Trust, Lion Foundation and the Spirit of Adventure Trust with generous support from the Royal New Zealand Navy. The New York Supreme Court said today that, due to its busy schedule, the hearing on the "constructed-in-country" issue could not be expedited. Therefore, it appears unlikely that a hearing will take place before the America's Cup match begins on February 8th. It is unfortunate that the legality of Alinghi's American-made sails probably will not be decided before the Match. However, it will be decided eventually. Justice Kornreich of the New York Supreme Court informed the America's Cup defending yacht club, Société Nautique de Genève, and the challenging Golden Gate Yacht Club today via telephone conference that she will not hear the American challenger's complaint regarding the ‘constructed in country' requirement of the Deed of Gift before the 33rd America's Cup Match which is scheduled to begin on 8 February. This means the 33rd America's Cup is free to proceed as ordered by previous New York rulings: in Valencia on the 8, 10 and 12 February. “This is excellent news. We are delighted that BMW Oracle's attempts to disqualify Alinghi and to win the America's Cup in court have been denied. We look forward to meeting them on the start line here in Valencia on 8 February to race for the Cup; something they can no longer try to avoid,” said Ernesto Bertarelli – two-time America's Cup winner – on hearing the news when returning ashore after today's race training session. The sterling silver ewer once known as the ‘£100 Cup' and named the ‘America's Cup' after America, the yacht of the same country that fought off the British fleet around the Isle of Wight in 1851, is the most sought after trophy in the sport of sailing. It has resided at the Société Nautique de Genève (SNG) in Switzerland since 2003 when the representing team, Alinghi – a first time challenger – wrestled it from the two-time winner, Team New Zealand, and returned it to Europe for the first time since the original race. Alinghi successfully defended the America's Cup for SNG in 2007 securing the trophy's Swiss residency until today when the Cup arrived at the Defender's base in Port America's Cup, Valencia, where it will be exhibited to the public in the house of the America's Cup at the Alinghi base. On site to welcome the trophy's arrival were Ernesto Bertarelli, Alinghi team president, who had just completed a day's race training on Alinghi 5; Rita Barberá, the Mayoress of Valencia; Ricardo Peralta, Spanish government delegate and Vicente Rambla, vice president Valencia regional government. “It is fantastic to see the Cup back in Valencia and in its home at the Alinghi base; I very much hope that visitors will enjoy the America's Cup during its stay,” said Ernesto Bertarelli, team president. * Alinghi is hosting a Public Open Day on Sunday 31 January from 09:00-18:00 – All are welcome! Dirk de Ridder. Image copyright Gilles Martin-Raget/BMW ORACLE Racing. 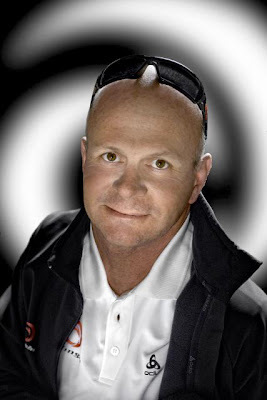 Dirk de Ridder (NED), known by his nickname of 'Cheese' on the team, has one of the coolest jobs on board the USA. "My role on the boat is as wing sail trimmer. I operate the functions and the sheet on the wing sail, and make sure it has the correct shape. To do that, I work closely with helmsman James Spithill to make sure we have the right balance and loading on the boat," he explains. Trimming the largest wing sail ever built is a long way from the family keelboat he used to go on sailing holidays with in the Netherlands with his parents. "I started sailing very young with my parents on a 33-foot keelboat, and then started sailing small dinghies. 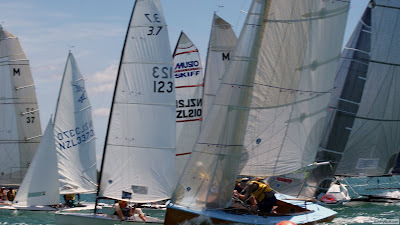 That turned into sailing at national level in keelboats and I went on to sail around the world three times - getting two seconds and a first place. Then, the Olympics in Sydney and several European and World titles in anything from a Maxi yacht to a small keelboat." Dirk de Ridder racing on board an Extreme 40. Image copyright Gilles Martin-Raget/BMW ORACLE Racing. The round the world win came with illbruck in the 2001 Volvo Ocean Race, the Olympic Games experience with Roy Heiner, who proved to be something of a mentor to de Ridder. "I've had the pleasure to sail with a lot of the big names in the sport, but the guy who really took me out of Holland was Roy Heiner, who helped me a lot." 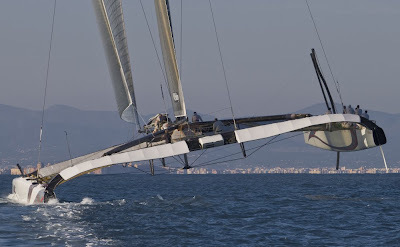 So how does sailing with the wing sail differ from sailing the trimaran with soft sails? "The biggest change is that there is no load involved with the wing sail. With a traditional mainsail, you're really involved in the loading of the whole boat and it's very easy to overload these types of boats. But that whole aspect has gone away, which makes my job much easier. It's almost like going back to sailing a small catamaran - that's how easy the whole wing sail operation is." "The surprise came when we started speaking about the initial design with the designers. They tell you the difference, but it's hard to comprehend how different it is. But then we started sailing small boats, the C-Class and A-Class and it's really impressive. The similarity between the small wing on those boats and the big one is they are basically identical. We have a better control system on the big wing sail, so we can do more with this than the small ones, but the way the air flows over it and the way it works is much the same." And now, after sailing on board USA with the wing sail, will it be difficult to go back to sailing more conservative monohull designs. "The difference between this and one of the old America's Cup boats is the difference between driving a lawnmower and a Ferrari. You can't even compare the two. These boats are so extreme, the speeds are extreme, the loads are extreme and there's an endless ability to go fast. "So it will never feel the same, but it would be nice to have some competition because we are sailing around alone. The boats are impressive, but you get used to the speed, to the loads, to flying on one hull. I think it would be nice to have 10 or 15 boats next to you competing. That's something we've all missed." 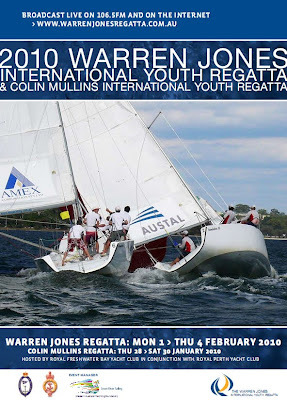 "One of the best youth match racing regattas in the world"
This exciting international match racing regatta was established in memory of yachting legend, Warren Jones through the Western Australian Yachting Foundation (Inc.) and the Warren Jones Foundation (Inc.). 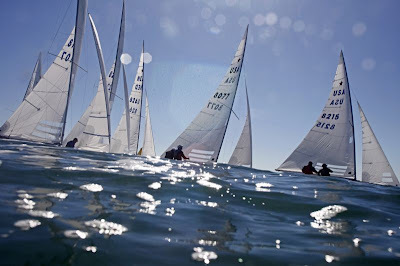 It has been held annually in Western Australia since 2003 and has grown into a highly regarded event on the international yachting calendar from which many young competitors have launched their match racing careers. The event is hosted alternately between the Royal Perth Yacht Club in odd years and Royal Freshwater Bay Yacht Club in even years and competitors sail in the Western Australian Yachting Foundation's matched fleet of Foundation 36 yachts which were designed specifically for match racing, providing a challenging platform for young sailors to develop and showcase their skills. Both Clubs provide a natural theatre with vantage points from which racing can be viewed and the onwater opportunities are magnificent for sponsors and spectators alike to be right in amongst the excitement of the yachting action. 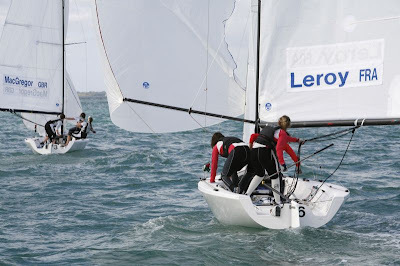 As part of the co-operation with other international events, the winner of the Warren Jones International Youth Regatta receives automatic invitations to the Open de España in Spain, the Australia Cup at the Royal Perth Yacht Club and to a World Match Racing Tour event. Terri Platell, Warren Jones' eldest daughter said of the event, "Our family is thrilled that this regatta has so quickly developed a reputation as one of the best youth match racing events in the world. My father would have been absolutely delighted that it has become an eagerly awaited international competition that provides so many future champions with the opportunity to participate in an international regatta of this calibre. "We thank the many people who have come together to make the regatta a world class event, in honour of our father." The timing and format of the annual event makes it appealing for both competitors and spectators, drawing the best -of-the-best of the World's youth match racing competitors for what has become known simply as 'The Warren Jones'. Young New Zealand skipper William Tiller from Auckland’s Royal New Zealand Yacht Squadron, built on a steady performance on the first day of the Colin Mullins Regatta, to assure his team a place in next week’s Warren Jones International Youth Regatta, by topping the scoreboard at the end of the round robin series. He shares the top spot with Sydney’s Kyle Langford and crew, representing the Cruising Yacht Club of Australia, while early contender David Gilmour of the host club sacrificed his chance of heading the scoreboard with a half point penalty following a collision with Langford in their match. Two flights have now been sailed in the first-to-three-points semi-final, with Langford 2 – 0 up against Gilmour, while Tiller has a half point advantage over Perth skipper Peter Nicholas, of Royal Freshwater Bay Yacht Club, who are hosting the regatta. David Gilmour’s father, Peter, one of the world’s greatest match racers has a knack to coming back from seemingly impossible situations to win regattas, Saturday will tell whether David has inherited this ability. In the meantime, the bottom half of the scoreboard is already confirmed, with Royal Perth Yacht Club’s Robert Gibbs 5th, the host club’s Tristan Brown 6th and Jordan Reece of the Royal Sydney Yacht Squadron 7th. The northern hemisphere teams of Dane, Martin Boidin, Yosaku Yoshida from Japan and Britain’s Mark Lees filled 8th, 9th and 10th places respectively. However Martin Boidin from the Royal Danish Yacht Squadron is certain of a place in the Warren Jones Regatta, having been guaranteed a wild card entry before he made the journey to Australia. Other places in the prestigious Warren Jones event will be decided on merit after the Collin Mullins Regatta final on Saturday evening. Alinghi 5 sail change. Look at the size of the HP on the outboards of the RIB (2x225HP)! 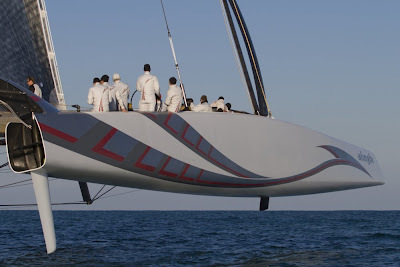 Image copyright George Johns/Alinghi. 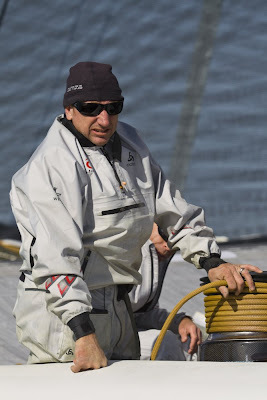 Simon Daubney (NZL) on board Alinghi 5. Image copyright George Johns/Alinghi. 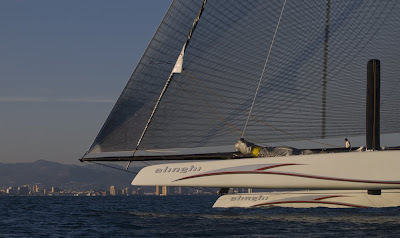 Alinghi 5. Image copyright George Johns/Alinghi. 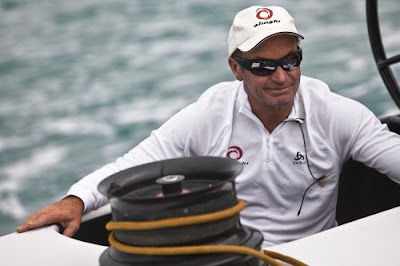 Loick Peyron at the helm of Alinghi 5. Image copyright George Johns/Alinghi. 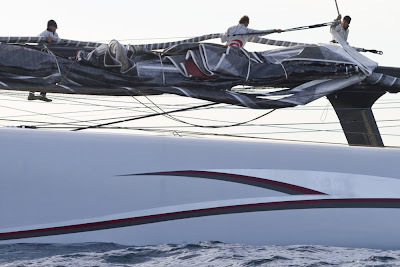 Alinghi 5 sail change forward. Image copyright George Johns/Alinghi. Alinghi 5 sail change. 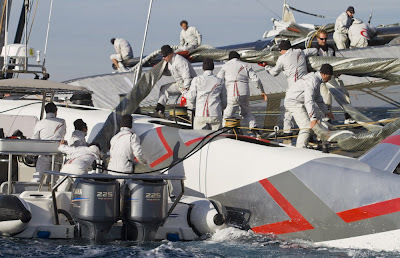 Image copyright George Johns/Alinghi. 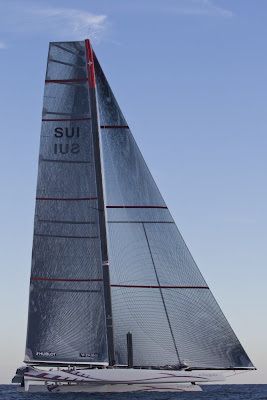 Alinghi 5. 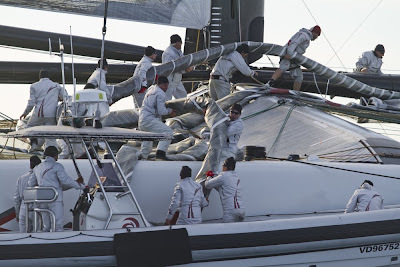 Image copyright Luca Butto'/Alinghi. 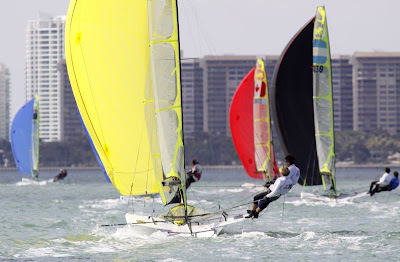 Clsoe racing in the Finns at the Rolex Miami OCR, with Ed Wright (GBR 11) in the lead. Image copyright Rolex/Dan Nerney. 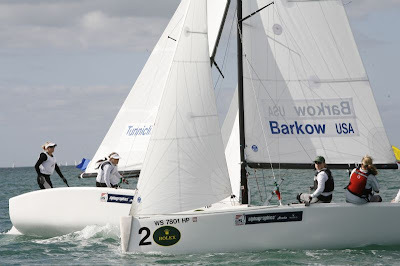 Some clear gaps are beginning to emerge in the Finn class after day four at the 2010 Rolex Miami OCR. Another win, along with a third for Ed Wright (GBR) extended his lead at the top, while Zach Railey (USA) had another consistent top five day to move within two points of second placed Giles Scott (GBR). Both races had restarts with a subsequent black flag start. 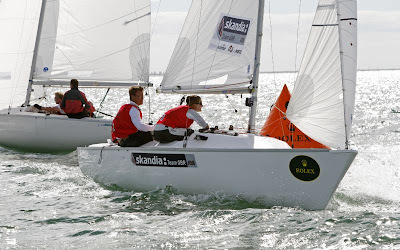 Three were disqualified in race seven, while four were pulled out of race eight, including three of the top 10 hopefuls: Brendan Casey (AUS), Mark Andrews (GBR) and Andrew Mills (GBR). However, two more testing races were sailed in 8 to 12 knots. The second race of the day was won by Gasper Vincec (SLO) with Jonathan Lobert (FRA) posting his best result of the series with a second and Wright ending the day with a third, after Mills - who crossed the line third - was black flagged. The win moves Vincec up two places to 4th overall, while Bryan Boyd (USA) sits on equal points in 5th overall. 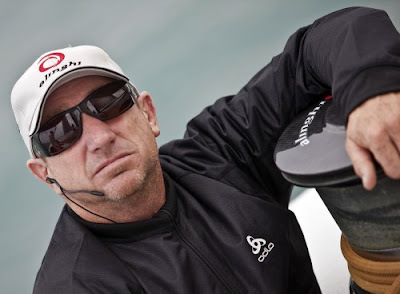 After a 4-5 on Thursday, Railey said, “It was another tough day, patchy and shifty, but I'm staying consistent.” In fact Railey has now posted eight top 5 placings, and has built a comfortable 13 point cushion on the rest of the fleet. Wright however has a 19th lurking in his score so needs to be careful in Friday's final qualification races not to pick up another high score. Wright's fourth race win has a built him a useful gap of 12 points on Scott and 14 from Railey and these three are expected to be fighting for the medals come Saturday. As usual the fight to make the cut for the medal race placings is also looking interesting, though three of the sailors black flagged today are sitting in 11th, 12th, and 13th, and have a lot of catching up to do. The final two qualifications races are scheduled for Friday, with the medal race for the top 10 on Saturday. Alinghi 5 training in Ras Al Khaimah. 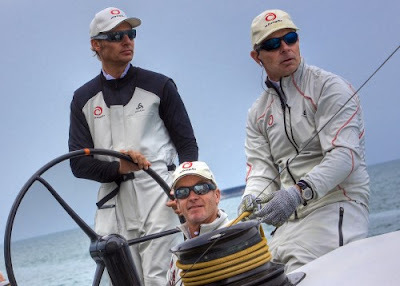 Ernesto Bertarelli helming, Warwick Fleury and trimmer, Pierre-Yves Jorand. Image copyright Carlo Borlenghi/Alinghi. 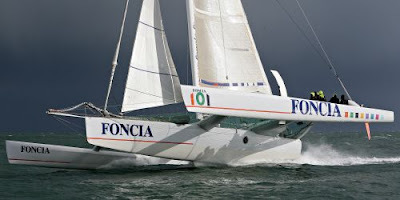 Alinghi training on FONCIA 60' trimaran (1st day). Alain Gautier at the helm. Image copyright Jacques Vapillon/Alinghi. Peter Evans. Image copyright Carlo Borlenghi/Alinghi. 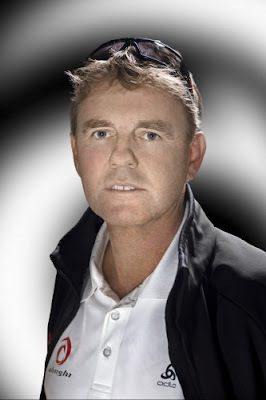 America's Cup tactician Peter Evans joined the Swiss Defender for the start of the 2006 sailing season. Evans brings a wealth of experience with four Cups - three with Team New Zealand (including two wins) and one with the Japanese challenge. He is a very accomplished dinghy sailor too, having twice represented New Zealand at the Olympics in the competitive 470 double handed class. Evans is a good “seat of the pants” sailor, thanks to his days campaigning in competitive dinghy classes such as the 470. In recent years he has been spending his spare time sailing a Bladerider, a hydrofoiling International Moth dinghy which flies above the surface of the water at many times the speed of the wind. Yves Detrey at the launch of the Alinghi D35 in Villeneuve. Image copyright Carlo Borlenghi/Alinghi. 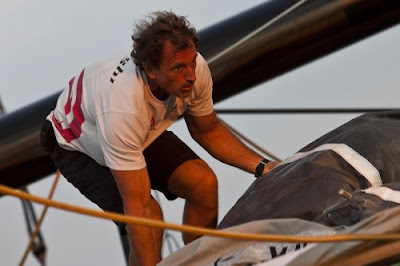 Yves Detrey started sailing with Ernesto Bertarelli more than 10 years ago. 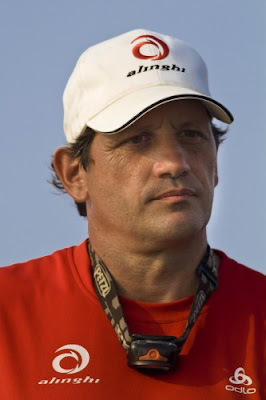 In 1999, he joined the Swiss Maxi One Design, Alinghimax and for two years he dealt with technical matters on board, taking part in races and winning the Bol d'Or in 2000 and 2001. 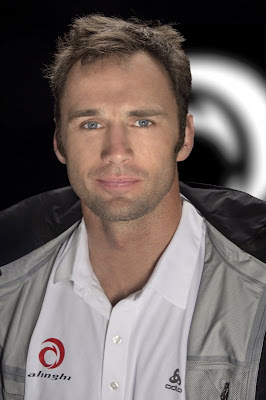 His break into America’s Cup sailing came about in Auckland, when he was asked to stand in for an injured crew member on the Fast 2000 team during the Louis Vuitton Cup. 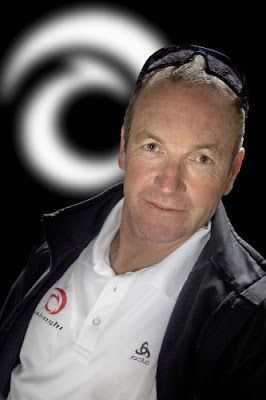 Three years later he joined Alinghi and has been with the team ever since. Nils Frei on board Alinghi 5 in Genoa. Image copyright Carlo Borlenghi/Alinghi. Nils Frei. Image copyright Carlo Borlenghi/Alinghi. As a sailor who grew up around the Swiss lakes, Frei was already well aware of fast catamaran technology. After his high school exams he threw himself at an Olympic 49er campaign but that fell apart when he went to study in a different town than his sailing partner. 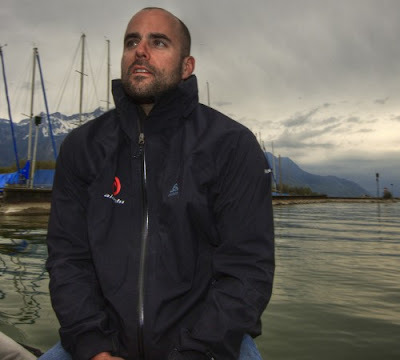 Furthering his studies at the University of Geneva with a degree in Geography he then worked for the Berne Economic Development Agency promoting economic activity in Berne before joining Alinghi in 2003. Joining Alinghi has been particularly memorable. “To win the America's Cup was by far the best I had ever done in sports and I'm really proud to be part of the Alinghi crew, where team spirit and respect are key to success. I'm also proud to be representing my country and to show through Alinghi, a multicultural, international and open minded Switzerland." Alain Gautier. Image copyright Carlo Borlenghi/Alinghi. Gautier, a father of five, first came to prominence as the winner of the challenging singlehanded offshore circuit in France, the Solitaire du Figaro in 1989. He went on to win the most challenging singlehanded race of all, the around-the-world non-stop Vendée Globe in 1992. He is also a big fan of Formula One motor racing, so it was no surprise when in the late 90s Gautier turned his focus on the fast and dangerous world of multihull racing, competing for many years on the ORMA 60 tri circuit. Now with the advent of 90ft multihulls for the America's Cup, the French speed-seeker is right in his element. 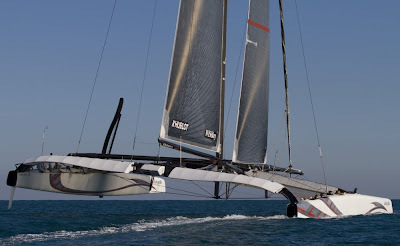 Gautier lent Alinghi the use of his 60-foot trimaran Foncia as part of the learning process of getting a group of monohull sailors up to speed with the principles of fast multihull sailing. It wasn’t an auspicious start, as the team accidentally capsized the boat during training, breaking the mast and injuring some of the crew, albeit not badly. Dean Phipps. Image copyright Carlo Borlenghi/Alinghi. Franck Profitt. Image copyright Jose Delgado/Alinghi. 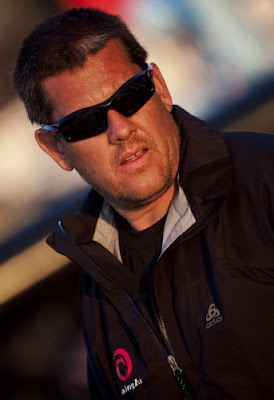 The 45 year-old Frenchman, with over 100,000 nautical miles of multihull racing to his name, brings decades of multihull experience to the team; he is a two-time Transat Jacques Vabre winner, four-time Tour de l'Europe winner, and winner of The Race aboard the giant catamaran Club Med. 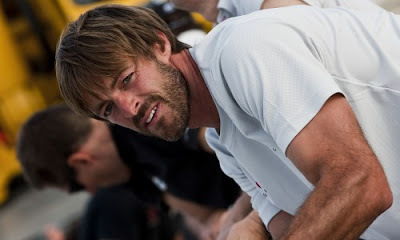 More recently he clocked up a lot of big multihull experience as a watch leader and helmsman aboard Groupama 3 during its record breaking 2007-08 season. Nicolas Texier. 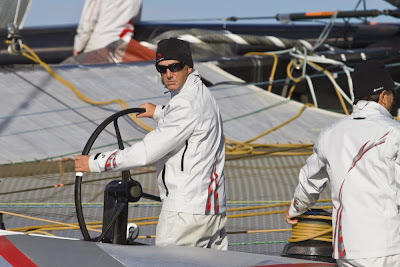 Image copyright Bruno Cocozza/Alinghi. Although the America’s Cup was not a childhood obsession like it was for some of his team mates, Texier is now as passionate about the Cup as anyone. He has no regrets about having joined Alinghi back in 2003. “In your life if you have this kind of opportunity you have to take it. There is a big melting pot on this team, an international team with many professional people. 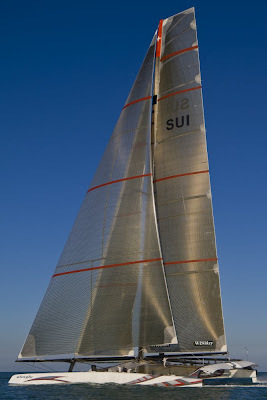 Simon Daubney aboard Alinghi 5 off Ras Al Khaimah. Image copyright Carlo Borlenghi/Alinghi. 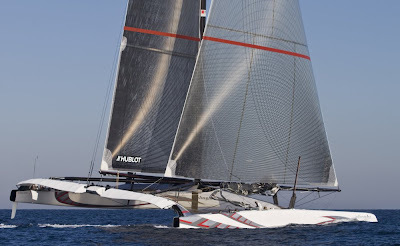 Despite the significant differences between Alinghi 5 and the Version 5 monohulls that preceded it, Daubney claims that fundamentally his job as trimmer hasn’t changed all that much. “What is different is that as a team we were very good at the tinkering with the Version 5 boats and just getting tiny little gains and making two or three incremental gains here and there. Some of the gains were so small you could hardly measure them; sometimes you just went with what you thought felt best. Daubney has a wealth of experience from three decades of racing, starting in trapeze dinghies such as Cherubs on his home waters of Auckland before moving into the match racing scene. He is an eight-time world champion, has competed in three Olympic Games in the Soling, and has been on the winning team for the past four America’s Cups. Alinghi testing in Ras Al Khaimah: Warwick Fleury. Image copyirght Carlo Borlenghi/Alinghi. As Alinghi's mainsail trimmer, he says: It's a boat speed role. I work closely with the helmsman and the other trimmers, getting the maximum performance out of the boat. This is fundamentally the same role on any sailing boat; finding the right balance between the sails and the boat itself, relative to the wind and sea conditions, so that the boat can be steered at its optimum." Warwick Fleury. Image copyright Carlo Borlenghi/Alinghi. Pierre-Yves Jorand. Image copyright Carlo Borlenghi/Alinghi. If there’s anyone in the team who is not that impressed by the speed of Alinghi 5 it should probably be Pierre-Yves Jorand. 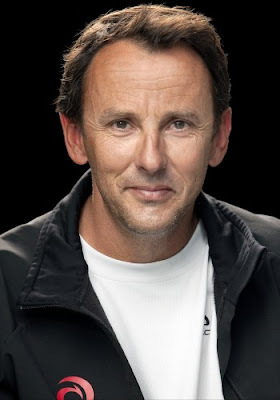 A former European champion in speed skiing, Jorand represented Switzerland in the 1992 Olympic Games in Albertville, France. Having achieved speeds of up to 225 km/h, he decided to give up the dangers of speed skiing after the birth of his daughter. Alinghi 5 in Genoa Alinghi training in Genoa: Lorenzo Mazza. Image copyright Guido Trombetta/Alinghi. "I like match racing, I like the focus of a team. I just enjoy what I do. I like sport." Lorenzo Mazza started sailing during his summer holidays with his father and sister and started racing when he was 16 years old. Since 1981 he has sailed professionally on IOR/IMS yachts, winning several World Championships, the Admiral's Cup and the Sardinia Cup. Joining Alinghi for the 2003 campaign he says; "I was honoured to be invited. Since joining the team I've discovered a lot of talented people here which is good because although I'd been involved in the Cup before, I realised I had never actually been in a position to win it. It was interesting to see close-up the differences to my previous experiences, to work with a group of people that knows what it's like to win and to be able to contribute to that winning formula was an opportunity that meant a great deal to me." Juan Vila. Image copyirght Carlo Borlenghi/Alinghi. Having studied Civil Engineering at the Polytechnic University of Barcelona, Vila did his first round-the-world race. While serving in the army for a year from 1989-1990 he sailed in his first Whitbread and with his technical background the obvious role for the Spaniard was to become the navigator. Since then, he has alternated Whitbread (Volvo) campaigns with America's Cup campaigns. Just weeks after winning the 2001-2002 Volvo Ocean Race he joined Alinghi to help with the electronics and navigation systems. 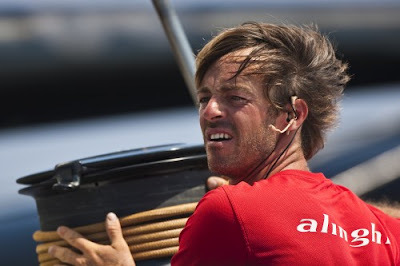 Vila enjoys the cosmopolitan make-up of the team, and believes it is one of Alinghi’s strengths. “I think the international team is one of the great strengths of Alinghi, you see different ways of doing things.” This has been particularly useful with the development of the multihull, which has required more free-thinking and fresh ideas than ever before. With Alinghi 5 capable of travelling up to four times the speed of a Version 5 keelboat, Vila knows that he has less time to extract all the information from the navigation systems. “It’s a challenge with the speed of the boat because everything happens quicker. The difference is that you have to anticipate more and just keep on relying on time rather than distance, because distance comes up very quickly. Also because the course is so long and you’re maybe many, many miles away from the next turning mark, you won’t be able to see it most of the time. 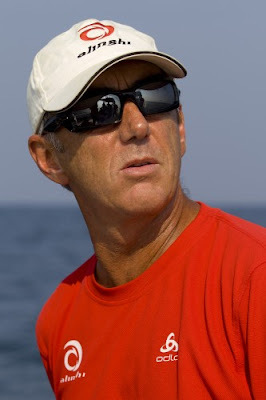 Alinghi 5 training in Ras Al Khaimah: Loick Peyron. Image copyright George Johns/Alinghi. 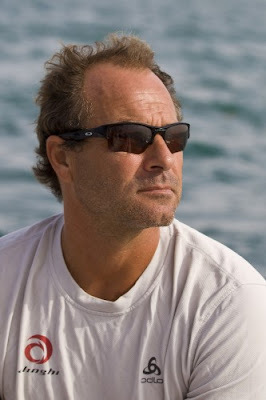 Loïck Peyron is one of the world's most renowned multihull sailors. The charismatic Frenchman has crossed the Atlantic 43 times, 18 of them singlehanded. He has raced around the world twice, holds three Transat titles and two Transat Jacques Vabres. The America’s Cup opens a new chapter in his career. "In every sailor's mind, the America's Cup is part of life. I have been following it for many years and now to be working for a team like Alinghi makes me proud," says Peyron. "There is a tremendous amount of work for sure, but it's a big challenge. An impressive strength of Alinghi is that it has a lot of knowledge from a lot of areas of the sport: monohulls, offshore sailing, multihulls; especially from Switzerland. The way the team works is based on team spirit and the method works really well; they have proved it many times. “For me it is really fascinating to see such a big family with a lot of ways of doing things which are quite impressive. It is really professional for sure. And there are a lot of people, that’s the main difference between this and other projects I’ve done. Even with all his long experience in multihull sailing, Peyron has found himself on a massive learning curve. “In terms of sailing, we are learning every day. We are learning a lot of things about big boats for sure because there is a lot of power and some special things really linked to the size itself which are very interesting to discover or to confirm. But also this has been a chance for me and the other French multihull veterans to test our experiences from other types of multihull and see how they apply to a boat of this kind. Anna getting Debbie wet. Image copyright Dave Hein, Miami OCR, January 2010. Racing was tight Thursday at the 2010 Rolex Miami OCR. We finished up the Gold fleet races and went 1-1. With this added to Wednesday's 2-0, we finished the round in second with a 3-2 record. Then, it was on to the Quarter finals round, against Lucinda Whitty from Australia. At the end of the day, we were up 2-0 in a first-to-three-point series. 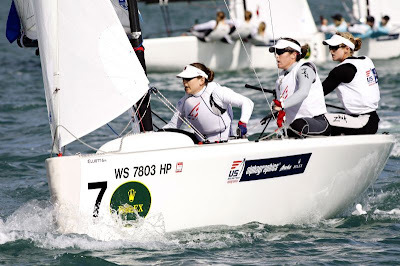 Sally BARKOW, Katie Pettibone, Nicole Breault (USA) vs Anna Tunnicliffe, Molly O'Bryan Vandemoer and Debbie Capozzi (USA) in the Women's Match Racing. Image copyright Rolex/Dan Nerney. Our first Gold fleet race Thursday was against the reigning ISAF Women's Match Racing champion, Nicky Souter. We led her off the line, but made a small mistake upwind, put ourselves behind, and were unable to catch up. 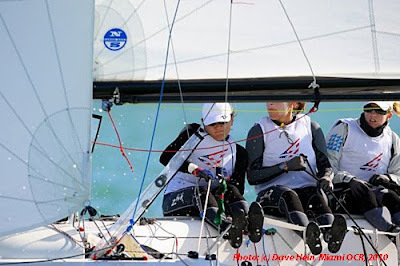 Anna Tunnicliffe, Molly O'Bryan Vandemoer and Debbie Capozzi (USA) in the Women's Match Racing. Image copyright Rolex/Dan Nerney. In the second and final race of the Gold fleet, we were matched up against our fellow Americans, Sally Barkow and team. It was a great race all around the race course. At the second windward mark, we got into a luffing situation that ran into the press boats. Luckily they got out of the way just in time so they didn't intefere with the race. On the downwind leg, we got into a short gybing duel. We gybed away and managed to hold her off by about half a boat length at the finish to take the win. That win put us in second overall in the round behind GBR's, Lucy MacGregor. Because we finished second in the Gold fleet, for the Quarter finals round (now a knock-out format), we are matched up against the winner of the repecharge, Lucinda Whitty (AUS). We had some really good races with the Aussies. The first race started with us ahead, but them passing us downwind. We had room on them at the leeward mark, but were not given it, so they were given a penalty. They spun their penalty, and we extended on them to take the win. The second race was much closer all around the course, but we held them off to the end and took the second race. The series is first-to-three-points, so we need to win one more Friday morning to advance to the Semi finals round. Samantha OSBORNE, Jenna Hansen and Raynor Smeal (NZL). Image copyright Rolex/Dan Nerney. Racing continued at Rolex Miami Olympic Classes Regatta 2010 Thursday with the kiwi crews now looking in solid standing to round out the regatta with good results. It was another beautiful day on Biscayne Bay with flat water and 8-10 knots of shifty breeze. Two days of racing remain with medals set to be decided on Saturday in Florida. Peter Burling and Blair Tuke hold onto 6th place overall after sailing another three races today. The kiwis started the day with a 2nd place, followed that with a 6th, but discard their most recent race where they were judged over at the start. “Peter and Blair are having a roller coaster ride with their individual race results in the 49er class,” reports Richard Burling, Peter’s father. The schedule allows for another three races tomorrow to wrap up qualifying before the top ten placed crews advance to the medal race on the final day of the regatta. Going into the penultimate day Burling and Tuke look in good shape to secure a spot in the double-points medal race finale. 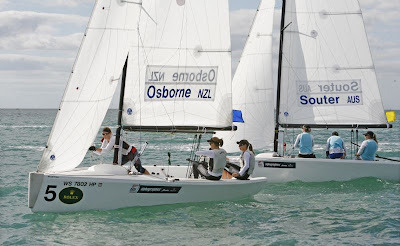 Completion of the Women’s Match-Racing gold fleet round robin this morning in Miami saw theNZL Sailing Team crew helmed by Samantha Osborne draw Australia’s Nicky Souter for the knock-out quarter finals racing. After winning one race a piece in the two quarter-final races sailed this afternoon, the remaining three races will determine who advances to the semi-finals. In the other quarter finals match-ups MacGregor (GBR), Tunnicliffe (USA) and Leroy (FRA) are all two – nil up on their opponents. New Zealand’s Joshua McKenzie-Brown improved his standing in the 2.4 Metre class moving up to 19th place overall after finishing 24th, 15th and 20th in today’s races. 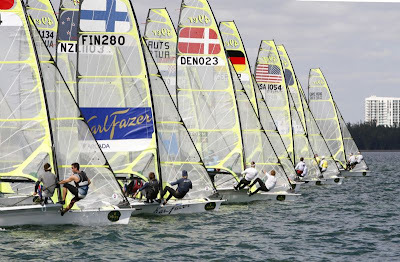 The next major international regatta to feature the members of the NZL Sailing Team is Trofeo SAR Princess Sofia Regatta on in Mallorca, Spain starting 27th March. At the start of racing in the 49er class on day 4. Image copyright Rolex/Dan Nerney. 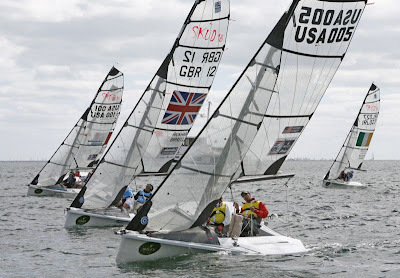 Today was a critical day for sailors competing in US SAILING’s 2010 Rolex Miami OCR, the second of seven stops of the International Sailing Federation (ISAF) Sailing World Cup 2009-2010. 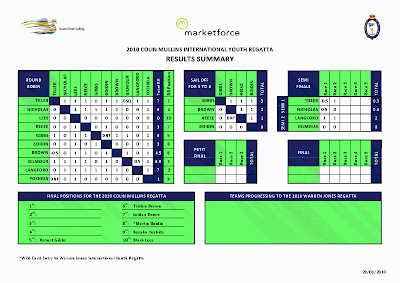 Highlighted by both lead changes and consolidations, it raised the heat for tomorrow’s final stretch: where medal winners in three Paralympic sailors will be named and top-ten sailors in ten Olympic classes will be determined for entry into Saturday’s medal races. 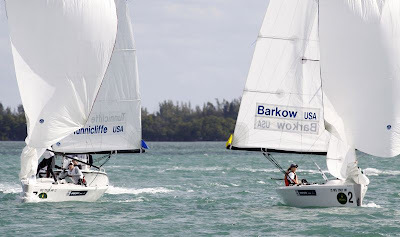 Representing 45 nations, 448 teams (633 athletes) are competing on Biscayne Bay for this annual event, which is one of the most important preparation regattas for sailors gunning for the 2012 Olympic and Paralympic Games. 49er fleet downwind on day 4 of racing. Image copyright Rolex/Dan Nerney. US Sailing Team AlphaGraphics’ Paige Railey (Clearwater, Fla.) finished the day with an 18-point lead overall in the Laser Radial class, followed by Spain’s Alicia Cebrian. While it seemed like it was going to be the steadiest day of the week, it ended up being another day of difficult racing for the 57-boat fleet. Railey said she fought through both of today’s races, from start to finish, and made quick changes due to continually shifting wind. 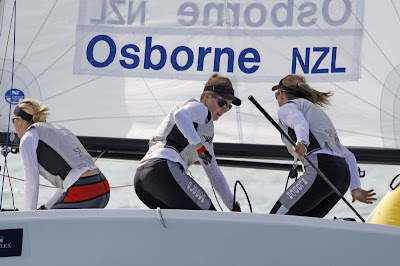 Samantha OSBORNE, Jenna Hansen and Raynor Smeal, NZL Women's Match Racing, and Nicole SOUTER, Stacey Jackson and Ray Martin, AUS Women's Match Racing. Image copyright Rolex/Dan Nerney. 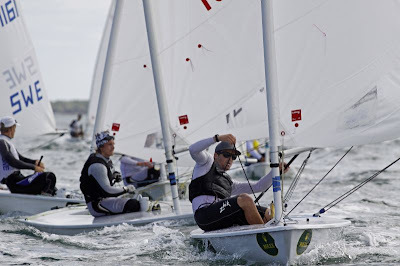 The UK’s Nick Thompson, who yesterday trailed leader Bruno Fontes by seven points in the Laser class, today soared past the Brazilian to take a 26-point lead. Such was Thompson’s fortune on the merit of posting two victories in as many races today while Fontes suffered a 20-44, setting him back to second place and tied on points with third-place finisher Jean-Baptiste Bernaz (FRA). Tense moments in the Laser class on day 4. Image copyright Rolex/Dan Nerney. 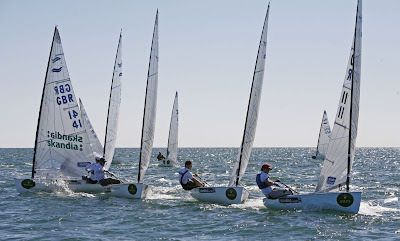 In the high performance dinghy event, racing among the top 49ers in the world has been especially competitive. The point spread tightened at the top today, with only nine points separating the first- and fifth-place teams. France’s Manu Dyen and Stephane Christidis maintained their lead in the 26-boat fleet after 12 races overall, five points ahead of Denmark’s duo of Simon Karstoft and Jonathan Bay who posted a consistent 3-3-3 today. In the first race of the day, the Phillips brothers from Australia had a good start off the line, maintained their lane to the left and were the first to tack on the left side of the course. They owned the middle for the rest of the beat and rounded ahead of the fleet. From there, they continued their lead through to the finish. The Finnish team of Lauri Lehtinen and Kalle Bask won the second and third races. The Star class head to the mark. Image copyright Rolex/Dan Nerney. Claire LEROY, Elodie Bertrand, Marie Riou (FRA) vs. Claire LEROY, Elodie Bertrand, Marie Riou (FRA) in the Women's Match Racing. Image copyright Rolex/Dan Nerney. 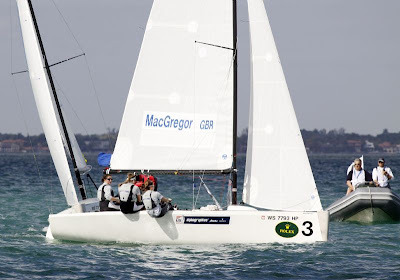 Lucy MacGREGOR, Annie Lush, Ally Martin (GBR) in the Women's Match Racing. Image copyright Rolex/Dan Nerney. John Robertson, Hannah Stodel and Steve Thomas (GBR) in the Sonar. Image copyright Rolex/Dan Nerney. Scott Whitman and Julia Dorsett (USA) followed by Alexandra Rickham and Niki Birrell (GBR) in the Skud 18. Image copyright Rolex/Dan Nerney. America's Cup: Alinghi 5's "point of no return"
America's Cup: It's a (Piece of) Cake!